Height 5 feet 7 inches. Weight 140 lbs. Chest measurement 34-36½ inches. Complexion fair. Eyes blue. Hair light brown. Sight, hearing and colour vision all good. Limbs well formed. Chest well formed. Heart and lungs normal. Teeth good. Free from hernia, varicocele, varicose veins, haemorrhoids, inveterate or contagious skin disease. Vaccinated. Good bodily and mental health. No slight defects. Lone Pine Memorial, Lone Pine Cemetery, Anzac, Turkey. Parents' headstone in Waimate Cemetery. John Atkinson Scott, who was born on 13 December 1890 at Morven, was known as Jack and was the older son of William and Catherine (née Atkinson) Scott, of Waimate. His father was from the Scottish Borders. In 1876 he went to Victoria, Australia, and in 1881 to New Zealand. He married Irish-born Catherine Atkinson in 1886 at Christchurch and they settled at Morven where William farmed. William was a member of the Waihao School committee during John's time at the school. From Waihao School John went on to the Waimate High School. William died in 1913 and after Catherine died in 1916, John's brother, William Francis Scott then living in Timaru, became the contact and next-of-kin for John. It was to his brother William that his medals (1914-1915 Star, British War Medal and Victory Medal), plaque and scroll were sent in 1921. After schooling at the Waihao Native School and Waimate High School, John was employed as a grocer and was managing Kernohan, McCahon and Company's store at Beaconsfield. He had registered for compulsory military training at Timaru and was among the first to volunteer. From the Territorials, he enrolled and passed the examination on 12 August 1914 at Timaru, in a very lively and busy Drill Shed; he was not one of those rejected because they were over age or under age, insufficiently developed, had no experience, or were overweight (the regulation weight was 12 stone). He was 5 feet 7 inches tall and weighed 140 pounds, with fair complexion, blue eyes and light brown hair. John fitted all the criteria and, unlike many, he had good teeth. He nominated his mother, Mrs Catherine Scott, of Junction Road, Waimate, as his next-of-kin. Jack, himself, was residing at Beaconsfield via Timaru. He was named as a Private in the infantry contingent to go under the command of Captain Grant and Captain Houlker. The South Canterbury infantry arrived in camp on 17 August and quickly settled down in the quarters prepared for them. On 17 October 1914 he was promoted to Corporal, immediately after embarking on 16 October from Lyttelton for Suez, Egypt, with the Canterbury Infantry Body. Here was another fit, fresh-faced young man in the prime of life, who went forward to his death; who disembarked at Alexandria on 4 December 1914 and before his 24th birthday had been killed in action at the Dardanelles, Gallipoli. Little would he have dreamed of this fate. John was one of those whose death is recorded as on 25 April 1915, but really all that is known is that it occurred between 25 April and 1 May. When the casualty list was received in Timaru on 23 May, sympathy was expressed for the parents who had been bereaved. The flag at the Municipal Chambers was flown at half-mast. The Mayor asked citizens to fly their flags at half-mast on the 24th, "out of respect to the memory of the gallant men who have fallen in defence of their country." The Otipua bachelors' ball in June 1915 was postponed indefinitely because of the death of Private J. A. Scott, their secretary. At the May 1915 meeting of the Waimate Borough Council, a resolution of sympathy and condolence with the relatives of Lieutenant Maurice and Corporal Scott, who had lost their lives at the Dardanelles, was carried by members standing – “That this Council expresses its sincere regret at the loss sustained by this district through the death of Lieut. Maurice and Private [sic] J. A. Scott in the defence of their country, and its sincere sympathy with their relatives in their grief.”. The St Augustine’s Young Men’s Society, Waimate, held a mock banquet on 13 July 1915, at which a toast was proposed to “Our Boys at the Front”. Many of their members were the first to volunteer for service. By this time several of them had been wounded and one had given his life – Jack Scott. On 1 August 1915 a memorial service was held at Knox Church, Waimate, for Corporal Scott and two other local servicemen who had laid down their lives for their country at the Dardanelles. The choir sang a special anthem. “Killed in action!” What nobler and more honourable epitaph could be inscribed on the little wooden crosses which mark the graves of our dead on the Peninsula? His future was one of great promise, but his unselfish spirit was strong to realise the path of duty. Better by far to sacrifice that bright career in the cause of Empire than to live in shame at having heard the call to duty and heeded it not. The splendid example of such heroes, as Corporal Scott, might well be taken to heart by many of our civilian comrades in New Zealand to-day. In this time of such a colossal national crisis, have they greater claims to a life of ease and pleasure than the millions who have done and are doing their share to-day? Jack left surviving him his mother, his one brother and five sisters. His brother William Francis Scott of Dunedin also served in World War I. Sympathy was expressed to his brother William in 1915 by the Timaru Branch of the N.Z. Drivers', Firemen and Cleaners' Association. John and William had cousins who served in World War I with the American Forces. John had left all his documents and papers in the custody of his mother but there was no Will. Letters of Administration were granted to his mother in September 1915, his estate being valued at £556. When Mrs Scott died in January 1916 her executors were her son William and two daughters Jeannie and Wilhelmina. 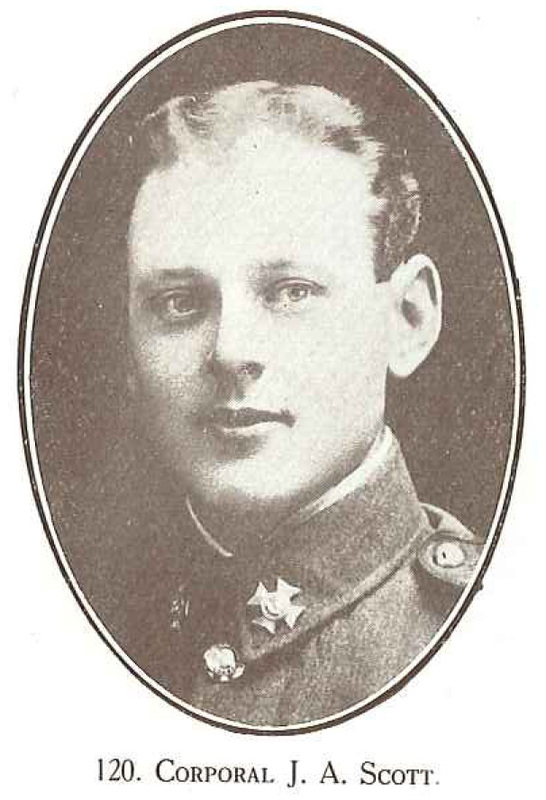 John Atkinson Scott is remembered on the Lone Pine Memorial at Gallipoli, on the Timaru War Memorial, the Otipua District War Memorial, rhe Waimate Memorial, and the Waimate St Augustine’s Church Memorial, and on his parents' headstone in the Waimate Cemetery. The name of Corporal J. A. Scott also appeared under “Paid the Supreme Sacrifice” in the Roll of Honour published regularly in the Waimate Daily Advertiser.